The persecution of Julian Assange and wikileaks for publishing diplomatic cables, and information on the Afghanistan and Iraq wars is just the latest in government suppression of freedom of speech and human rights and liberties, which past generations have fought for including the men and women of the Eureka rebellion in Ballarat in 1854. I have just returned from Ballarat where I was part of the commemoration of the Eureka Rebellion in 1854 - the 156th anniversary. The struggle for democratic rights and liberties and against corrupt government continues in 2010. Although 22 diggers are listed as having died on the day of the attack on the Eureka stockade and massacre, it is likely many more diggers who were spirited away by friends died from their wounds in subsequent days. Of about 120 people thought to have stayed in the stockade that Saturday night, only 60 are known to have survived. Of the soldiers who died storming the stockade, Captain Wise died that day, and five others died from their wounds later. 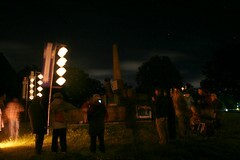 So 30 people gathered before dawn at the Eureka Stockade monument on December 3, 2010. Master of Ceremonies was Dr Joseph Toscano of the Anarchist Media Institute who gave a brief account of Eureka, and its meaning for today. 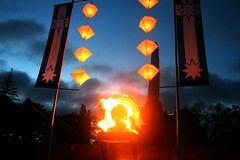 The dawn vigil was broadcast live and streamed on the internet by Melbourne Community radio 3CR. The microphone was passed around the people gathered in a circle for each to talk about the meaning of Eureka for society and for themselves. The Dawn vigil had attracted people from around Victoria, Queensland and New South Wales and 3 West Papuan refugees. Jacob Rumbiak, a prominent West Papuan from the independence movement, compared the struggle at Eureka with his own nation's struggle for independence from Indonesia. 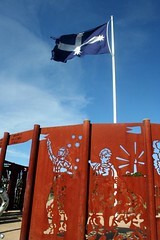 The diggers of Eureka saw the Southern Cross in the sky and adopted that has their primary emblem for their flag. The West Papuan independence movement used the morning star as their flag emblem. Another person recalled an ancestor who was a prominent trade union official in Brisbane responsible for implementing the boycott of Dutch shipping to stop the recolonisation of Indonesia by the Dutch, an action by the Australian trade union movement which allowed crucial time for the Indonesian independence movement to consolidate their power and achieve independence from Dutch rule. As Australians we need to act in solidarity with the West Papuan independence movement to overthrow the tyrannous and savage Indonesian rule of their country. The spirit of Eureka is deep within our West Papuan friends. Just before dawn in a separate little action Graeme Dunstan of Peacebus.com burnt an effigy of the Prime Minister, Julia Gillard. The burning was in reaction to recent comments by Gillard in the debate in parliament on the war in Afghanistan and Iraq that Australia may be engaged in war for the next ten years. Welcome to the world of George Orwell's 1984, and the never ending war. After 6am the circle dipersed, some to their cars, motel rooms or caravans to catch some sleep, others to have breakfast in Eureka Memorial Hall. At 9am people gathered again and marched, banners and flags flying, down to Bakery Hill. Bakery Hill is a grassed roundabout with a flagpole. It was the traditional meeting place of the miners in 1854 attracting up to 10,000 people on accasion to meetings to hear reports of delegations, arguments over moral force versus physical force, and to make decisions. For the last few years a meeting at Bakery Hill on December 3 has been the occasion of announcing Eureka Australia medals for Australians who have acted in the spirit of Eureka. Many are unsung heros who have contributed to their community or trade union or in public debates to defend and advance basic human rights and liberties in keeping with the Eureka oath and the spirit of Eureka. One of this years award recipients was Dorothy Wickham for her outstanding hisorical research regarding the Eureka rebellion and the people of Ballart at the time of the gold rush. Her works include The Eureka Encyclopedia, and her most recent book, Women of the Diggings Ballarat 1854. Both these titles are published in Ballarat by small publisher - Ballarat Heritage Services. 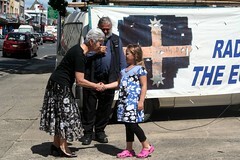 Before leaving Bakery Hill, a young girl and Jacob Rumbiak recited the Eureka Oath, which was resworn by all those present: "We swear by the southern cross to stand truly by each other and fight to defend our rights and liberties"
Outside the Ballarat Town Hall Mayor Judy Verlin joined the gathering and gave a short speech before assisting one of the younger generation to raise the Eureka Flag on the flagpole in the middle of Sturt Street. The raising the Eureka Flag ceremony has ocurred the last couple of years and has come as a result of continual calls for Ballarat city council to fly the Eureka Flag from the top of the town hall on the anniversary. The council, which uses the story of Eureka for tourism and marketing the city, still has some way to go in giving adequate recognition to the event by the token symbolism of flying the Eureka flag in a place of prominence on each anniversary. The last destination of the march is the old Ballarat General Cemetery to visit the Diggers and Soldiers memorials. In previous years both memorials had a flag on the flagpoles. This year the flags were absent. 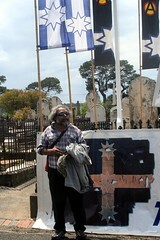 A Eureka Flag was volunteered and raised on over the diggers memorial. Jacob Rumbiak spoke at the Eureka Diggers Memorial outlining the similarities in the Eureka struggle, and the struggle for independence in West Papua that continues today. He highlighted the fight for independence, justice and human rights and liberties continues in places such as West Papua where Indonesian authorities continue to deny basic rights and liberties; where raising the Morning Star flag of the independence movement can get you 10 years prison. The diggers memorial was built about a year after the massacre by Geelong stonemasons and funded by public donations. The soldiers memorial was not built until some 21 years after the massacre at the behest of the Victorian Government. In the wording of the Soldiers memorial we see an attempt at whitewashing the reasons and effectiveness of the Eureka rebellion. After the Cemetery there was a looong walk back to the Eureka park for a picnic lunch. A small theatrical performance on Eureka took place but was interrupted by torrential rain and storm with everyone running for cover into Eureka Hall. Friday evening the inaugural Radical Spirit of the Eureka Rebellion dinner was held at a restaurant with Dorothy Wickham being the guest speaker and providing a talk on the radical women of Eureka, in between helping to pass out plates of food around the cramped tables. An entertaining talk based on her most recent research on the women of Eureka, their lives, and contributions to the events of the time. Eureka's Children also held an event on the anniversary: a dinner in Melbourne with guest speaker Professor Stuart Macintyre. Eureka's Children is the organisation of descendants of participants in the Eureka events. On the Saturday Eureka's Children met at Bakery Hill and walked first to Ballarat Trades Hall where the Government encampment once was, then to the Mechanics Institute on Sturt street. Unfortunately the leaders of this group set a cracking pace through the mall and lost half the people on this walk. In the Humffray room of the Ballarat Mechanics Institute a small gathering of people watched a re-enactment/play of the various digger delegations that were made in an attempt to avoid an uprising. John Humffray was an early leader of the Ballarat Reform League and one of the proponents of "moral force" (resolving disputes through moral argument and peaceful means). After the play there was a forum on Eureka and Democracy. 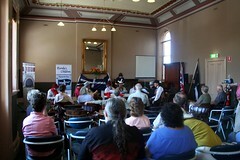 Instead of drawing out the relevancy of the Eureka events to current problems and debates, the forum got sidetracked into the local politics of the expansion to the City of Ballarat owned Eureka Stockade Centre. Unfortunately phase two of this development is secret and details could not be revealed. I almost called out "For godsake would someone post the plans to wikileaks so we could get some transparency on this development for a publicly funded and operated centre" But I didn't. The Forum wound up and I went and had coffee with some friends before heading back to Eureka Park and a refreshing time in the swimming pool. 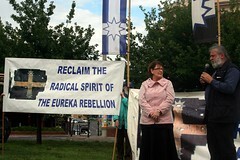 Being a descendant of Eureka should not give one necessarily more say in interpreting the history and meaning of the Eureka rebellion and its ongoing legacy for today. So where is the Spirt of Eureka? So where is the spirit of Eureka? Well, it is pretty strong in those that attended from West Papua who are still fighting a tyrannous regime (Indonesia) for human rights, liberties, self determination and independence. It is also with Julian Assange and the Wikileaks crew (whoever they may be) in their attempts to bring transparency in Government policy and decisions by publishing leaked Government documents - showing the true spirit of Eureka in making Government decisions more transparent and helping to prevent and expose Government corruption of the democratic process. At Bakery Hill this year there were verbal calls for Julian Assange to be nominated to receive a Eureka Australia Medal. US constitutional attorney Glenn Greenwald said on Democracy Now "whatever you think of WikiLeaks, they’ve never been charged with a crime, let alone indicted or convicted. And yet, look at what has happened to them. They’ve been essentially removed from the internet, not just through a denial of service attacks that are very sophisticated, but through political pressure applied to numerous countries. Their funds have been frozen, including funds donated by people around the world for his—for Julian Assange’s defense fund and for WikiLeaks’s defense fund. They’ve had their access to all kinds of accounts cut off. Leading politicians and media figures have called for their assassination, their murder, to be labeled a terrorist organization. What’s really going on here is a war over control of the internet and whether or not the internet can actually serve what a lot of people hoped its ultimate purpose was, which was to allow citizens to band together and democratize the checks on the world’s most powerful factions. That’s what this really is about. It’s why you see Western government, totally lawlessly, waging what can only be described as a war on WikiLeaks and Julian Assange outside the bounds of any constraints, because that’s what really is at stake here." In Australia a plethora of prominent people released an open letter to Julia Gillard calling for Julian Assange to be given full support as an Australian citizen and urged a statement of Australia’s commitment to freedom of political communication. The spirit of Eureka could be in the heart of each one of us when we make a stand to truly fight to defend our rights and liberties, whether it be on a local, regional, national or international level in campaigning for justice, Government transparency, or against corruption in all its myriad shapes and forms. I issued the twitter below this morning. I am wondering if the sentiment expressed may be of interest to you. I am about to write an article on the matter. Should December 3rd be our national day? If it were, this may open the way to Australia becoming a republic and a truly independent nation. If Dec 3rd were Australia's national day, remembering Eureka we may have stood by West Papua and refused to invade Iraq for revenge and oil.